Optical Women's Association - What is the Optical Women's Association's Emerging Leader Award? What is the Optical Women's Association's Emerging Leader Award? The Emerging Leader Award, created in 2018, is presented to a woman who is a rising star and exemplifies leadership qualities as a new distinctive talent within the Optical Industry. Examples may be a Millennial or GEN Xer but not limited to these generations. Unlike the Pleiades and Pyxis Awards, the Emerging Leader Award may not necessarily be presented every year. 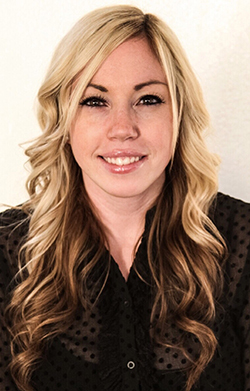 Jessica Goebert is currently the Senior Public Relations Manager for De Rigo REM in Los Angeles, CA. As a seasoned PR professional, she brings over a decade of diverse experience developing communications strategy for some of the most iconic brands across fashion, sport and lifestyle. This includes six years in the optical industry where she got her start at Luxottica Group, overseeing all brand communications for the company in North America before joining De Rigo REM, where she is responsible for leading all communications, social media, advertising, events and industry relations. As an active member of the OWA, Jessica serves as the co-chair of the Digital Marketing Committee where she has spearheaded content creation and messaging for the OWA's social platforms. She has also participated in event planning for the organization's regional events in Southern California. Some of her achievements include dressing FLOTUS Michelle Obama and Octavia Spencer for the Oscars, receiving CLIO Image Award and Platinum PR Award nominations, and being named by Vision Monday in 2017 as one of the most "Influential Women in Optical" in the Rising Star category.